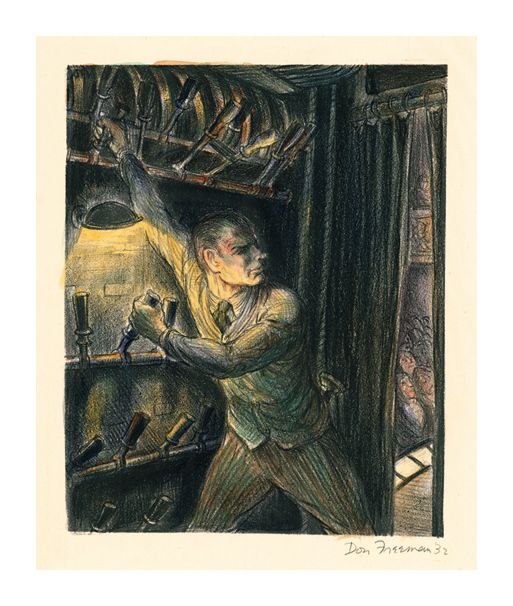 Electrician = 1932, Lithograph with hand coloring in watercolor. McCulloch 43. Edition unknown, unique impression. 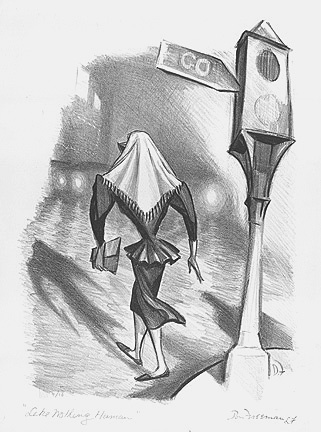 Signed and dated in pencil. Signed in the stone, upper left. Image size 8 5/8 x 6 7/8 inches (219 x 175 mm); sheet size 11 7/8 x 9 1/8 inches (302 x 232 mm). A fine, rich impression, with fresh colors, on cream wove paper; full margins (1 x 2 1/4 inches), in excellent condition. Hand colored by the artist for his friend Arnold Rubin. Ex. collection Ernest Shapiro. 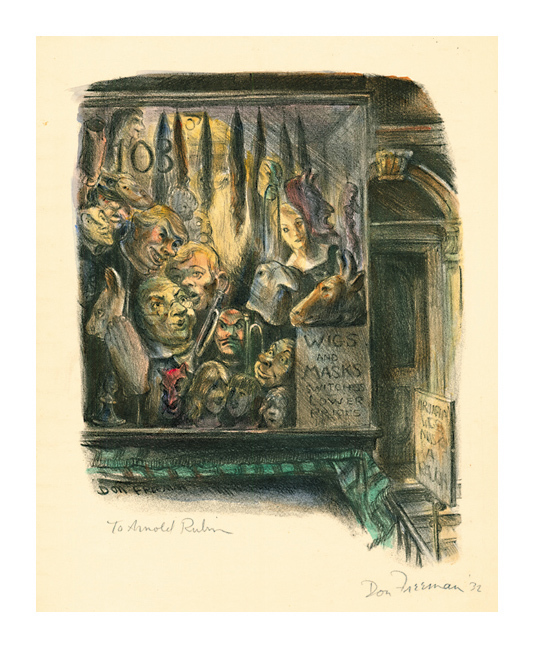 Wig and Mask Window = 1932, Lithograph with hand coloring in watercolor. McCulloch 121. Edition 25, unique impression. 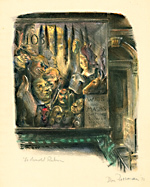 Signed, dated and inscribed To Arnold Rubin in pencil. Signed in the stone, lower left. Image size 9 5/8 x 7 1/2 inches (244 x 191 mm); sheet size 12 x 9 1/8 inches (305 x 232 mm). A fine, rich impression, with fresh colors, on cream wove paper; full margins (3/4 x 1 3/8 inches), in excellent condition. 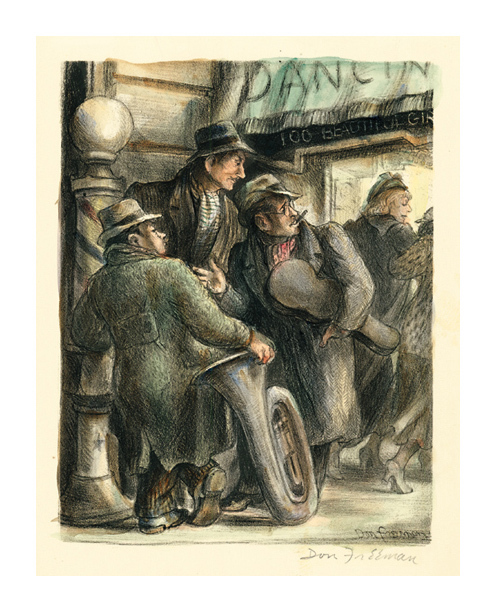 Passing Fancy = 1934, Lithograph with hand coloring in watercolor. McCulloch 98. 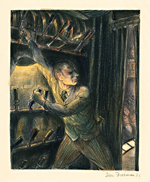 Edition 25, unique impression. Signed in pencil. Signed in the stone, lower right. Image size 8 1/8 x 6 1/8 inches (206 x 156 mm); sheet size 9 1/2 x 7 3/4 inches (241 x 197 mm). A fine, rich impression, with fresh colors, on cream wove paper; full margins (5/8 x 7/8 inch), in excellent condition. 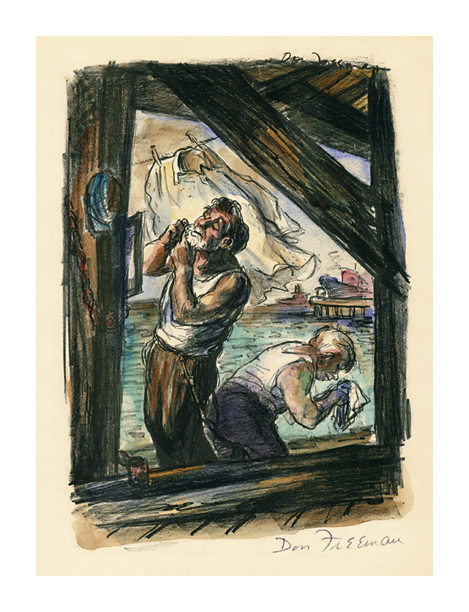 Sunday Morning = 1934, Lithograph with hand coloring in watercolor. Not in McCulloch. Edition unknown, unique impression. Signed in pencil. Signed in the stone, upper right. Image size 9 1/2 x 6 3/4 inches (241 x 171 mm); sheet size 12 x 8 3/4 inches (305 x 222 mm). A fine, rich impression, with fresh colors, on cream laid paper; full margins (3/4 x 1 1/8 inches), in excellent condition. M108. 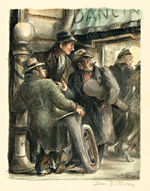 Edition c. 200. Printed signature in the accompanying AAG statement. Image size 9 1/2 x 12 3/16 inches (240 x 308 mm); sheet size 12 7/8 x 17 7/8 inches (327 x 454 mm). A fine, impression, on cream wove paper, with full margins (1 1/2 x 3 inches). Stains from the original tape hinges, verso, otherwise in pristine condition, with the original AAG folder/mat. 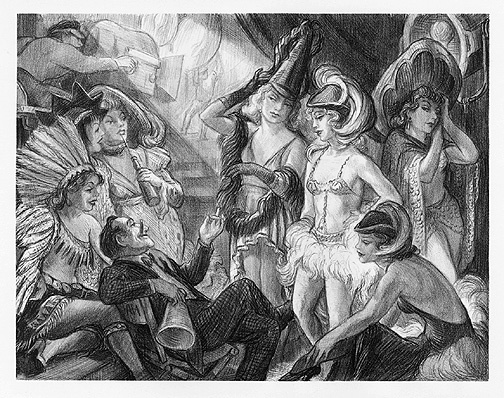 Published in an unlimited, unsigned edition by the American Artists Group, New York. Collections: ACH, UVA. 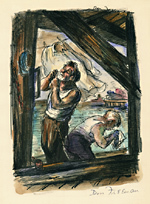 Like Nothing Human = c.1948, Lithograph. M136. Edition 10 plus 1 proof. Estate stamped and initialed LF in pencil. Titled and numbered 9/10 in pencil. Titled and numbered 9 in pencil, bottom left sheet edge. Initialed in the stone, lower right. With the printer's blindstamp (Lynton Kistler) in the bottom left margin. Image size 12 7/8 x 9 1/4 inches (327 x 235 mm); sheet size 17 x 12 3/4 inches (432 x 324 mm). A fine, rich impression, on cream wove paper, with full margins (1 1/4 x 2 1/2 inches), in excellent condition. Scarce.